Over the past year or so, Toppling Goliath Brewing out of Iowa has garnered HUGE buzz and popularity. 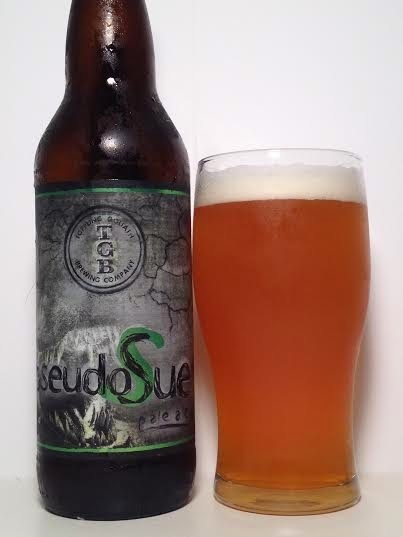 Today we have PseudoSue: a year-round American Pale Ale brewed exclusively with Citra hops. Pours a clear, orange with one-finger of white head. This is a very clean-looking pale ale. Using Citra hops, I expected a blast of tropical juices to be the dominant smell, but instead it is a ton of bitterness. It's very earthy, herbal, and floral on the nose. There's a subtle grapefruit-esque astringency hidden deep in the back. The taste is what I will call "bitter grapefruit". There's a significant hop presence combined with a citrusy flavor. I'm glad to see the Citra hops are more prominent on the taste than they were on the aroma. This is pretty bitter from front-to-back, but hints of orange and tangerine prevent this from being solely about bitter hops. It's quite nicely balanced. The mouthfeel is light to medium with little carbonation. While there is a bitter presence, it finishes smooth and clean. Overall is this is a pretty good pale ale. There is both tropical fruits and hops on the taste with a clean, bitter finish. Considering the style and that this is a single-hop ale (with Citra), I was hoping for a more dominant juicy aroma and taste to balance out the bitterness. In the end, the bitterness is not overwhelming, but is more prominent than any citrus notes that might be there.